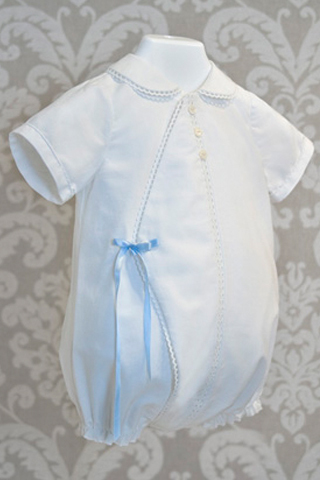 Heirloom Memories boys christening outfits are designed for both beauty and comfort. This one-piece bubble is perfect for both the christening ceremony and any post events. Also a wonderful outfit to just dress up a precious girl or boy when you want them to look extra special. 100% cotton batiste – Hand wash in lukewarm water, with soft detergent. Air Dry. Press with iron on cotton setting. 100% linen – Hand wash in cool water, with soft detergent. Air Dry. Press with iron on cotton setting.